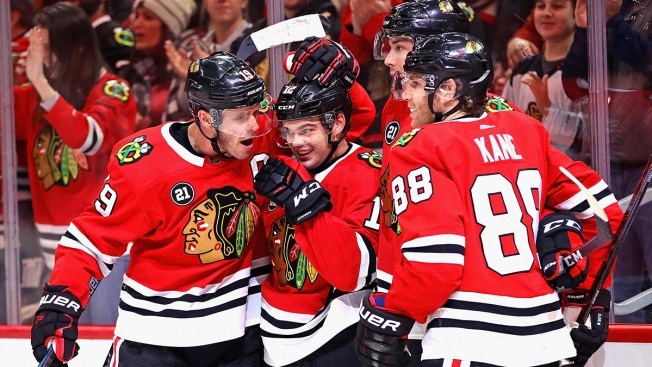 The Chicago Blackhawks, improbably, find themselves in the hunt for a wild card spot as the NHL season heads to its final stretch. The Blackhawks, who at one point this season had the worst record in the league, are now just one point behind the Minnesota Wild for the second wild card spot, and will have an opportunity to jump ahead of them as they take on the Colorado Avalanche at the United Center on Friday evening. Unfortunately for Chicago, there are five other teams that they are battling with for a wild card spot in the conference. The Dallas Stars currently hold the top wild card spot, with 65 points in 60 games this season. The Blackhawks trail them by four points, but have played one more game. To help break down the Blackhawks’ playoff chances, we took a look at each team’s remaining schedule down the stretch. The Coyotes, who currently sit one point behind the Wild, play eight of their final 21 games against teams currently in playoff contention. The Coyotes do have some tough road games on the docket, facing the Atlantic-leading Tampa Bay Lightning and the Metropolitan-leading New York Islanders, and they do have a game against the Blackhawks coming up in late March in the desert. The Blackhawks are also one point out of a playoff spot, and they have 10 games left this season against teams currently in playoff position. The big games for the Blackhawks will be the three games apiece that they have left against Colorado and Dallas, both of whom are battling with Chicago for a postseason berth. The Blackhawks also have games left against the Canucks and Coyotes. The Avalanche, who will visit the United Center Friday, have three games left against the Blackhawks, and have a total of 10 games remaining against playoff teams. They have to play 10 more road games this season, and nine of them are against teams that are currently in the hunt for a playoff berth. The Stars have a fairly easy schedule down the stretch, with only eight games left against playoff opponents. They do have three games left against Chicago and two against Colorado, and those could go a long way toward determining their fate. Of all the teams in the wild card hunt, the Wild may have the toughest road forward. A staggering 15 of their final 21 games are against teams currently in the postseason, and they have a stretch where they play six straight games against top-tier teams, including the Lightning. The Wild do have three key home games in the season’s final days, but those are against Nashville, Winnipeg, and Boston. The Canucks are two points out of the final playoff spot in the West, and they have 11 games left against playoff foes. They do have a nice, long seven game homestand left to play this season, but big-time clubs like the Blue Jackets, Flames, and Sharks are among those heading to western Canada during that stretch.